Carefully selected, hand salvaged Alberta barn wood. Brushed nickel, laser etched RebornBarns openers. Powerful rare earth magnet that can hold up to 70 caps. Crack off your favorite brew in style. 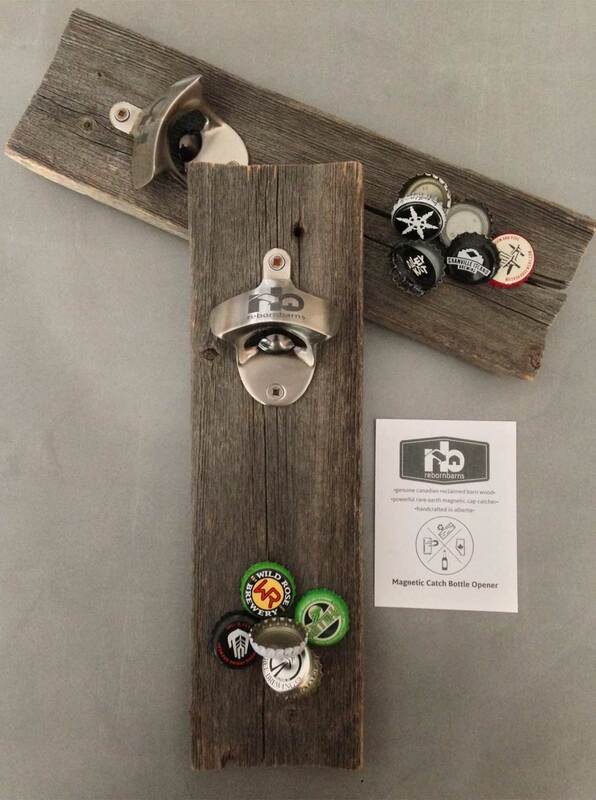 Open your bottle on the satin nickel RebornBarns opener and the cap drops and clings to the farm fresh, hand picked barn wood below. •Magnetizes to your fridge, tool chest, RV, or any magnetic surface. •Makes the perfect gift for husbands, groomsmen, buddies, brothers, or any beer lover. •Each one is unique but they’re all made with love.